This is a sponsored post written by me on behalf of Yumbox. All opinions are my own and all lunches were eaten by my family. This lunch is pretty basic: lots of fruits and veggies with a little chicken salad and some crackers to keep your motor running all afternoon. I start by making a chicken salad: dice some leftover roasted chicken and a similar amount of apple, then mix in a small handful of dried cranberries and a few toasted nuts (I use pecans and almonds interchangeably in this recipe). Add a dollop of mayo to hold it all together. I’ll also add a shake of curry powder sometimes too. (Not too much!) 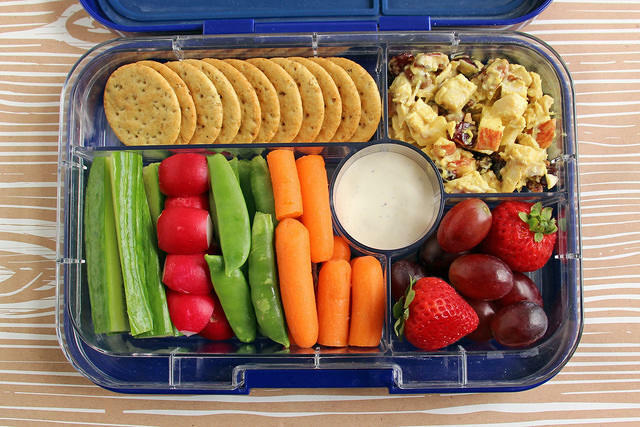 Pack it into the Yumbox with some whole wheat crackers, grapes, berries and a selection of raw veggies. I used cucumbers, radish, snap peas and carrots but you can use whatever you like/have in the fridge. Squirt some ranch dressing in the dip container for the veggies. This is probably Zach’s favorite lunch of all the stuff I pack for him and I try to keep a lot of these items on hand to throw quick lunches together for him. Cut a whole wheat pita into wedges and put those in the largest section of the Yumbox. You can toast them and let them cool if you have time in the morning. Pita chips are even easier. Add some hummus or tzatziki to the dip well. Chop a little cucumber and mix it with grape tomatoes. Then dice some feta cheese and mix it together with pitted kalamata olives. 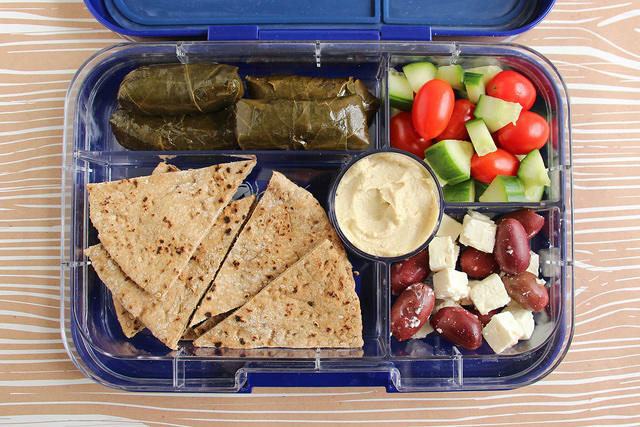 For an extra special treat, pick up a few dolmas from the deli or salad bar while you’re at the grocery store and add those to the lunch box too. At lunch time you can dip the pita into the hummus or spread it on the bread and sprinkle it with the veggies, cheese and olives and eat it like a tiny slice of pizza. So amazing! When we are out and about, Zach and I both like to grab the Protein Bistro Box at Starbucks for a quick and generally nutritious lunch. (Healthier than a slice of lemon loaf, amirite?) The thing is, those boxes are hecka easy to make at home and if you make a big batch of eggs at the beginning of the week you can pack them in less than five minutes in the morning. The hardest part of this is the sliced apple because you don’t want it to turn brown. My trick: sprinkle the slices with Fruit Fresh powder and they’ll stay white until lunch time or longer. (The air-tight lid on this container helps a lot too.) 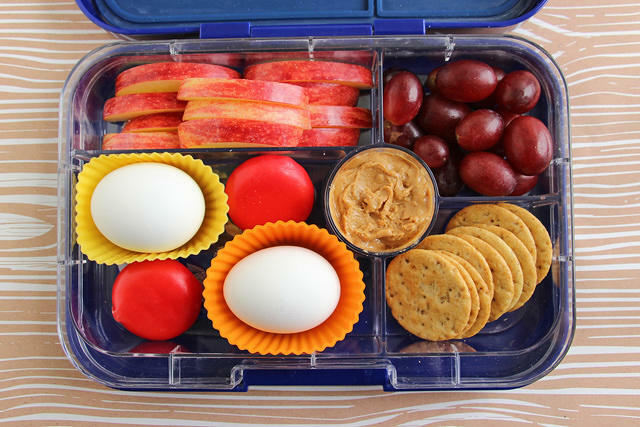 Fill up the rest of the box with pre-washed grapes, wheat crackers, peanut butter, Babybel cheese and a couple of hard-boiled eggs. Finally, I’m going to share one of my very favorite meals: the antipasti platter. Aw geez, I LOVE THIS SO MUCH. I started eating this meal at a local restaurant about 20 years ago and I’ve been recreating it for fast dinners at home ever since. The backbone is melon wrapped with strips of prosciutto, then I add a few super flavorful sides. One is small balls of fresh mozzarella mixed with halved cherry tomatoes and a sprinkle of balsamic. The other is a mix of marinated artichoke hearts and strips of roasted red peppers — both pulled straight from jars in the fridge. I also added some flatbread crackers and a little goat cheese to spread on it. 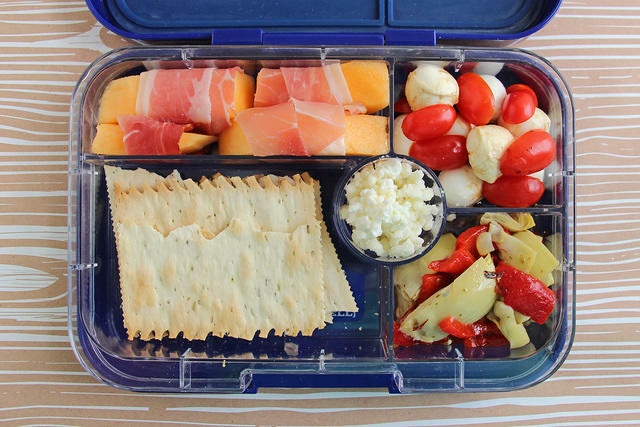 What do you pack when you make snacky lunches? This is a sponsored post written by me on behalf of Yumbox. Find the Yumbox Tapas on the Yumbox website or at Amazon.com.